Registration for Discovery 2018 is open. Be sure to order your tickets now and take advantage of the early bird pricing – only $650 until March 16th. The Discovery conference will be filled with insightful sessions you won’t want to miss. Sessions like “A game or a gamble? You decide” where we will discuss the difference between gaming and gambling and what the implications are for each. Or, the “ABCs of VLTs” where we uncover the unique challenges VLTs bring to RG. To see the full lineup of sessions click here. The Responsible Gambling Council is seeking leaders who have knowledge and experience in good governance, strategic development, risk management, and building a high-performance culture and brand. RGC believes it is vital for our Boards to reflect the diverse communities that we serve. We are committed to equity and the full range of diversity - age, gender, race, ethnicity, disability and socio-economic status. Voluntary self-exclusion (VSE) programs enable problem gamblers to engage in a break from casino-based gambling. The current study analyzed the effects of a VSE program in British Columbia, Canada on problem gambling symptoms and the comparative reductions in problem gambling symptoms when participants abstained from gambling, continued to participate in non-casino based gambling, or attempted to violate their exclusion contract. The results imply that some gamblers can successfully engage in non-casino based forms of gambling and still experience reductions in symptoms of problem gambling. Future analyses will explore characteristics associated with group membership that may help to identify which participants can successfully engage in non-casino based gambling without re-triggering symptoms of problem gambling. Do you have new research to share with your colleagues? 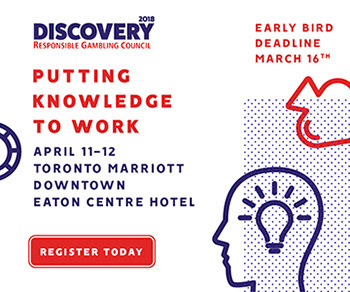 Don't miss the opportunity to contribute to the Responsible Gambling Council's Discovery 2018 conference. Abstracts should include: title of research, names of author(s) with the presenting author underlined, author affiliation, and contact information. The submission can address any area of gambling research. A best poster award will be adjudicated and presented during the closing session. Decision notifications will be sent by Friday, February 2, 2018. All presenters must register for the conference. Note: Maximum poster dimensions = 6 feet (wide) x 4 feet (high).